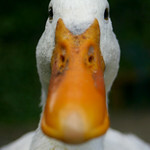 We have now been rescuing and rehabilitating ducks and other birds for over 9 years. In this time, we’ve had nearly 100 big personalities come and go, and our motley crew is constantly changing. 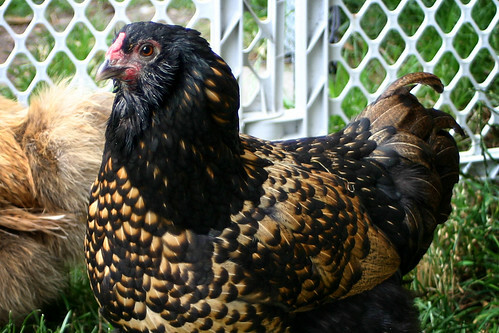 Sometimes we worry that sharing our rescue work may inspire people to get ducks or chickens, which isn’t something we encourage for most folks. About half of all ducks and chickens hatched each year never live to see their first birthday, so adding a flock to your family is not something to take lightly. All of our feathered and furry family members are rescued. Most are cast-offs of the urban farming craze, and others were injured or dumped. If anyone is considering adding a flock of chickens or ducks to their family, we strongly encourage adoption and animal rescue. 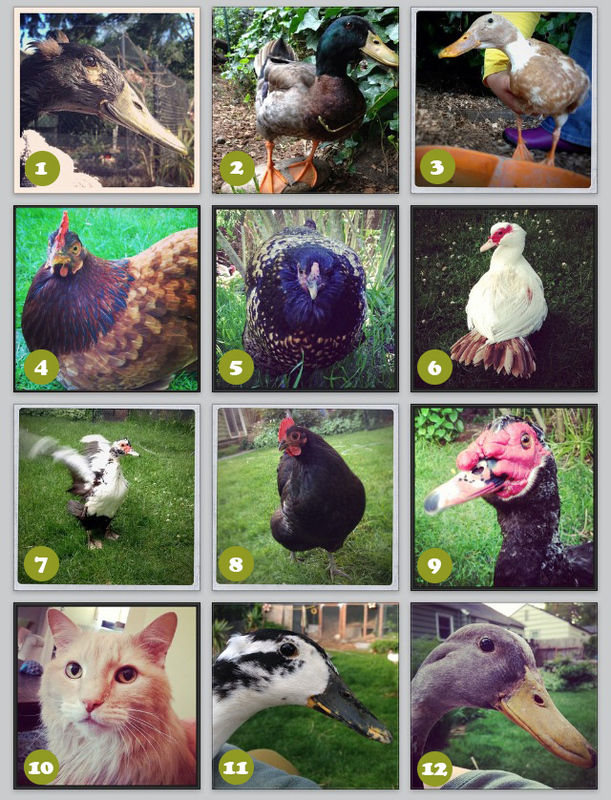 So, so many ducks and clucks need safe, forever homes, and there are never enough good homes. Please don’t breed or buy animals. Here’s a little update on our current cast of characters, including how they came to live at Ducks and Clucks. 1. 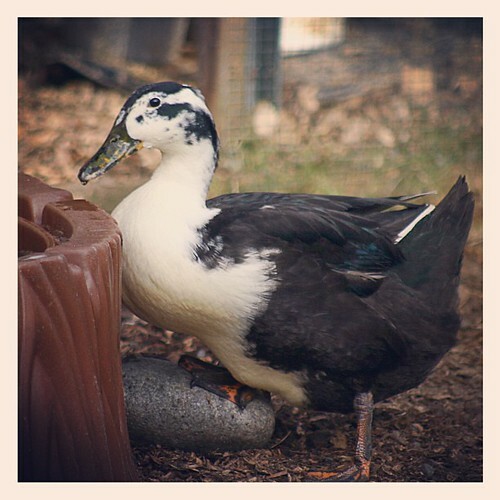 Lester Leroy is a crested cayuga or runner duck who came to us in January 2011. 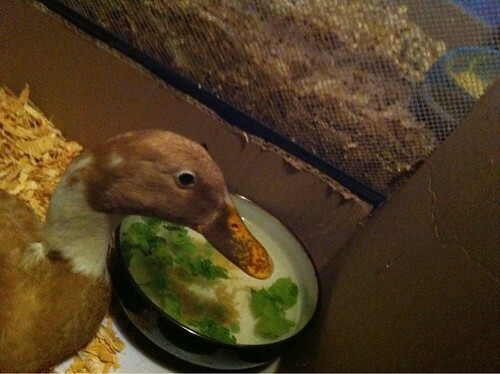 He is one of our most handicapped ducks. He was attacked by a dog and left untreated for nearly two weeks. Then he was surrendered to the Seattle Animal Shelter. 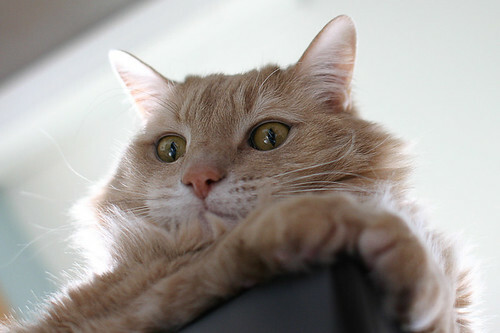 He was recommended for euthanasia, because he couldn’t stand or walk or even sit normally. But we agreed to try and rehabilitate him. With physical therapy, he can now sit, stand and walk all on his own. It isn’t graceful, but he gets around just fine with some extra protection from the other more aggressive ducks. Lester is smitten with Danny girl and very protective of her. 2. Miles is a domestic rouen duck, very similar to a wild mallard but larger and unable to fly far. 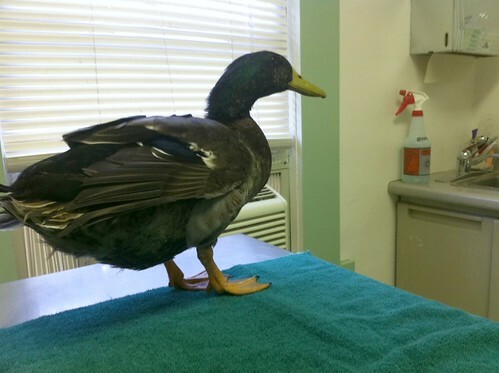 He was dumped in a park and developed a very serious leg infection. South Sound Critter Care in Kent, WA rescued him. But since he’s domestic, handicapped and can’t be returned to the wild, he came here to stay. Miles is also smitten with Danny girl, but a little too aggressive to live with her as a companion. So he loves her from the far side of the fence. He came to us in January 2012. 3. 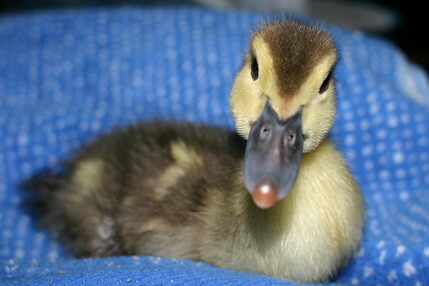 Danny girl is an Indian Runner duck. She was surrendered to PAWS in Lynnwood, WA in a very bad state. They only treat wild animals, so we were called to help. An x-ray determined that she had swallowed a very large slug of metal. Danny underwent antibiotics for an infection and months of chelation medication to safely dissolve the metal that was poisoning her. She was left with some permanent damage from the metal toxicity, but she gets around okay and is a very sweet girl. She loves both of her good buddies, Lester Leroy and Miles. She has been with us since December 2011. 4. Carol hen came to stay with us in April 2011. We went to pick up a fluffy rooster who needed medical care from the Seattle Animal Shelter, and Carol was there as well, so we brought her home. 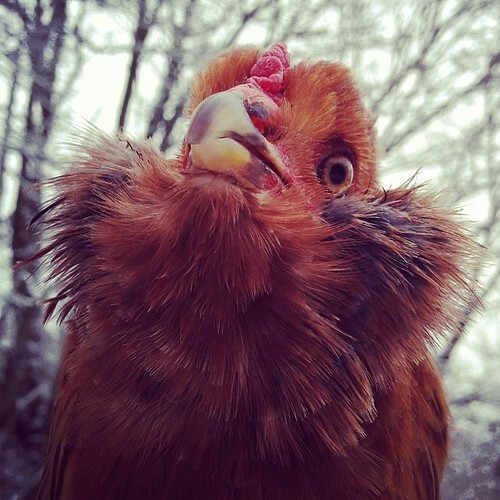 Fabio the rooster went to another sanctuary when he was better, but Carol was here to stay. She wasn’t injured, just homeless. She had been found wandering a neighborhood in North Seattle and was picked up by animal control. 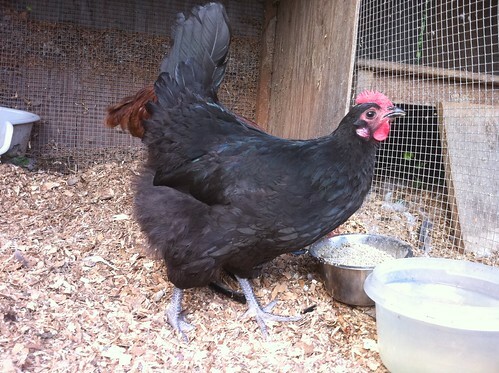 She is a fierce, cranky hen who has grown into a lovable but noisy sweetheart. 5. 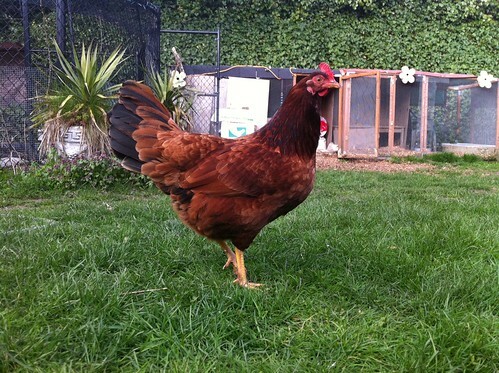 Olivia is a sweet old hen who came in with another hen and a handicapped duck in July 2009. Both she and her friend Racquel L’Oreal, who has since passed from old age, came in with parasites and respiratory infections from living in unsanitary conditions. 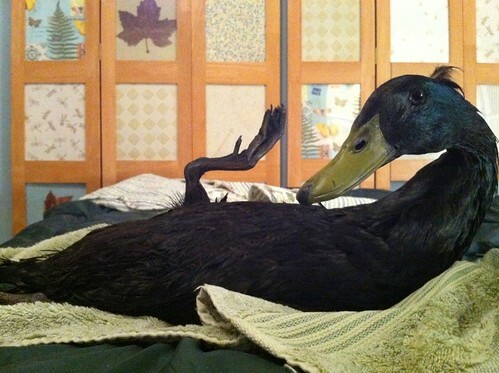 Their duck friend was euthanized after her handicaps became too severe and her quality of life declined. Olivia is estimated to be over 12-years-old now, which is a good reminder to anyone thinking of getting chickens. They can sometimes live for well over a decade with good care and nutrition. 6. Petunia Peach is a muscovy duck we adopted from another sanctuary in January 2006 to help even out our flock when we ended up with too many drakes. She is probably almost 9-years-old now and still doing well. She came to us with a sister named Phoebe Kay, who passed on from yolk coelomitis, which is unfortunately a common reproductive problem with ducks and chickens bred to lay many eggs. Petunia has been O’Malley’s companion for many years. 7. 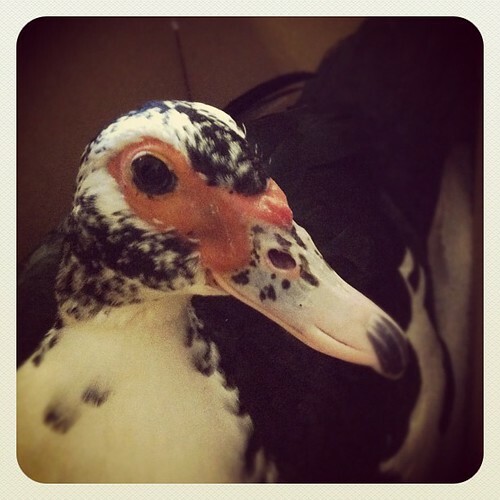 Lenora Bea is a muscovy duck who came to us in November 2012 from the Seattle Animal Shelter. She was found wandering in a South Seattle neighborhood. Many ducks and chickens are surrendered to the Seattle Animal Shelter, and we don’t always have room to help. But this time it was the right time and the right kind of duck to fit right into our flock. She is O’Malley’s new companion, and she helps keep him on his toes. 8. Olly Astro hen came to us in August 2010 after being surrendered to a veterinarian. She had severe pneumonia that required 8-weeks of antibiotics to treat. She is still prone to respiratory infections, but has done well here. She also has recurring egg issues and was spayed to help cure her chronic reproductive infections. She came in along with her friend Janet who has since passed on. 9. 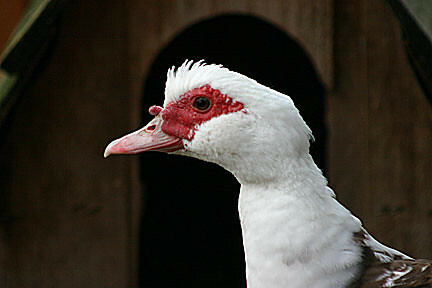 O’Malley Peepers is a muscovy drake duck who arrived in September 2005 as a baby duckling. He was found abandoned and alone in a park in Gig Harbor, WA and taken to PAWS in Lynnwood, WA for rehabilitation. Within a day, they realized he was growing faster than his mallard cohorts and too friendly to be a wild duck. So we agreed to take him in. He is our big boy, and the flock member who has been with us the longest right now. He loves his two ladies Petunia Peach and Lenora Bea, but he also loves his people. 10. Simon is our only furry family member right now. He was adopted from the ASPCA in NYC years and years ago, and he’s about 17-years-old now. He has lived with us in New York City, San Francisco and now Seattle. So he’s a well-traveled rescue kitty. 11. Ruby Tuesday is our newest rescue, a magpie duck found abandoned by the side of the road in Southern Washington in December 2012. A good samaritan drove her 3 hours to us, because they wanted to find a safe home for her. She is likely young, and she’s healthy and happy. She had a brief love affair with Miles but has since settled down with her steady beau, Lionel. 12. Lionel Ernest is a bantam saxony duck or hybrid pastel call duck who was dumped at Country Village stores in Bothell, WA in May 2012. He was taken in by PAWS in Lynnwood, WA and transfered to us for medical treatment. He had a severely infected and painful foot when he arrived, and he was really worried and scared. But now he’s doing well. He loves his lady duck Ruby and follows her everywhere, pointing out treats for her and protecting her from imaginary dangers. ALSO! Here’s the story for newcomer Si, not pictured above. Si came to us as a foster chicken in late November 2013. She had been dumped in a forest, rescued, and then attacked by a raccoon that unfortunately killed her friend. She was banded and wasn’t a first-year hen, so it’s possible she was dumped because she had stopped laying eggs or slowed down her egg production. She had a few minor bite wounds from her raccoon attack and an infected eye, but she recovered very quickly. 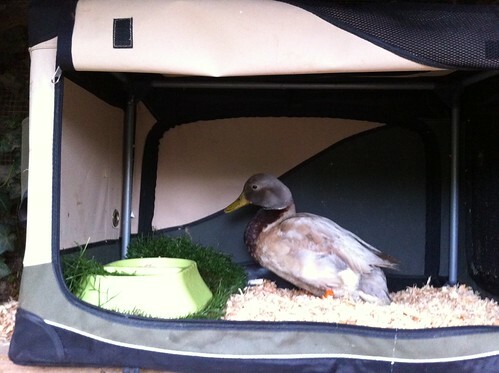 Unfortunately her rescuers decided not to take her back, so she became a permanent resident here at Ducks and Clucks. Whew! That’s a little background info on each of our current cast of characters. Sometimes needs change, and we work with other local rescue folks to try and bridge the gap for these birds in need. As we mentioned, for anyone considering ducks or clucks, we encourage you to do thorough research and find sources that DON’T sell animals to get the full story on their care and maintenance. We also encourage people to rescue and adopt, and never buy or breed more animals while so many await safe, forever homes.